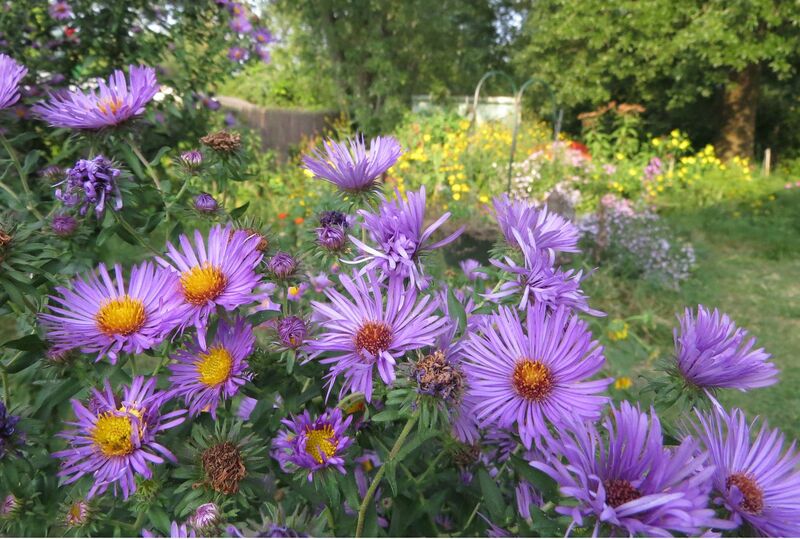 New England Aster, Symphyotrichum novae-angliae. This is the first year I've seen Tiger Swallowtails taking interest. 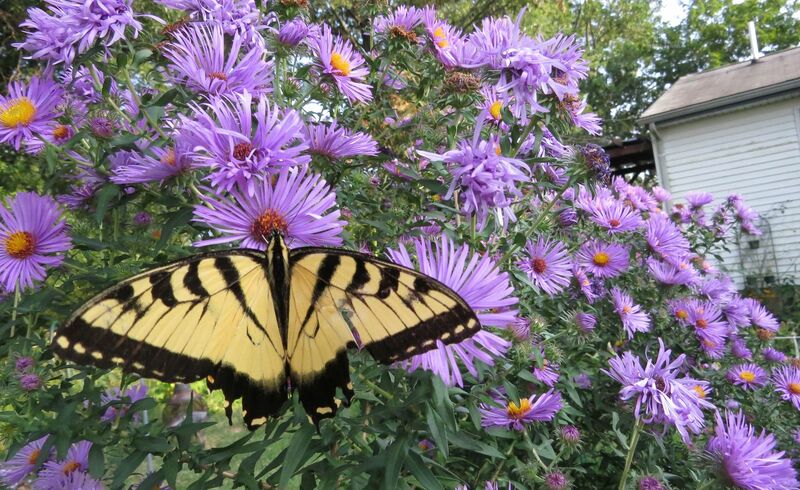 It's been an odd year for butterflies in general though. I believe the hornet's nest in my neighbor's tree and yellow jacket's nest in my other neighbor's lawn played a roll in this. Wasps don't often fall for caterpillar tricks, nor do they care about toxins until after they've chewed them up, whereas a bird might damage them in a nonlethal way. Hopefully next year will be better. 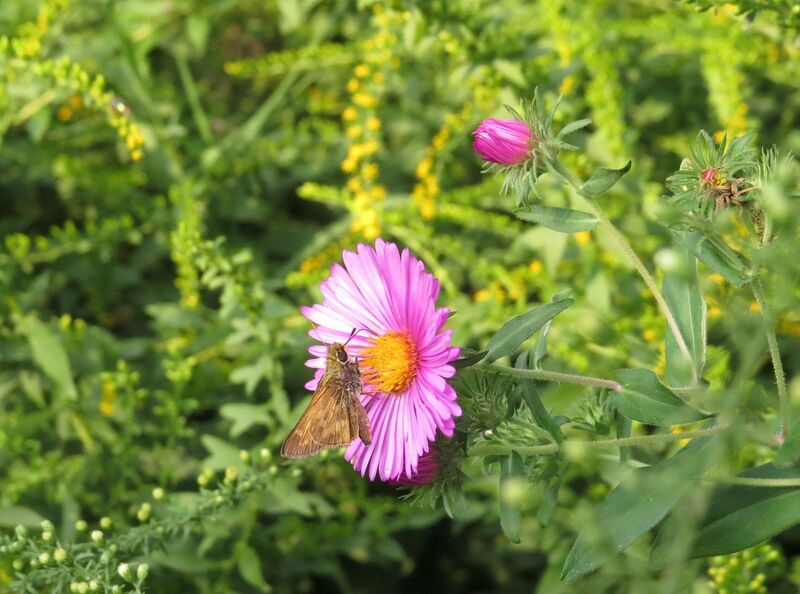 New England Aster, Symphyotrichum novae-angliae. I've had one of these for years and it hasn't spread until recently. I believe they're not self compatible and thus aren't weedy at all until more than one is planted. While they haven't become super weeds yet I'm actually enjoying the color variation. Purple seems to be the dominant tone, but this one pictured above is slightly paler. I've seen white too and everything from there to hot pink are all possibilities. 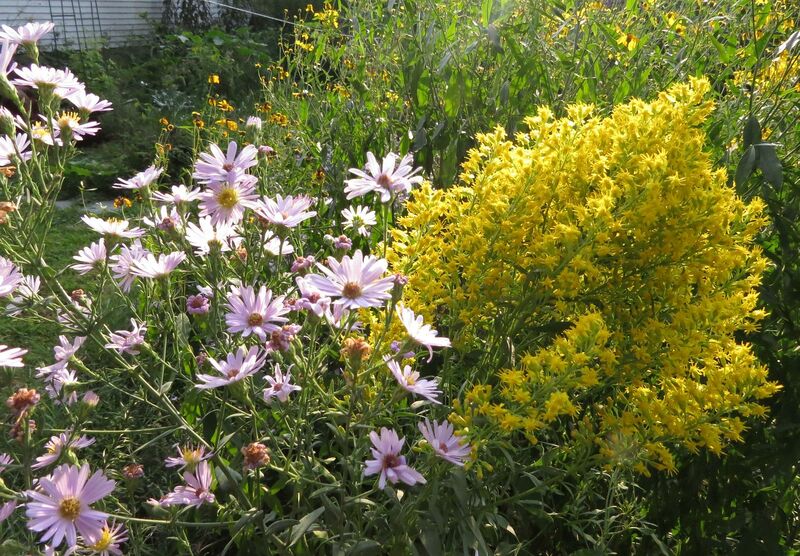 Showy Goldenrod, Solidago speciosa, and one or two other Symphyotrichum species. 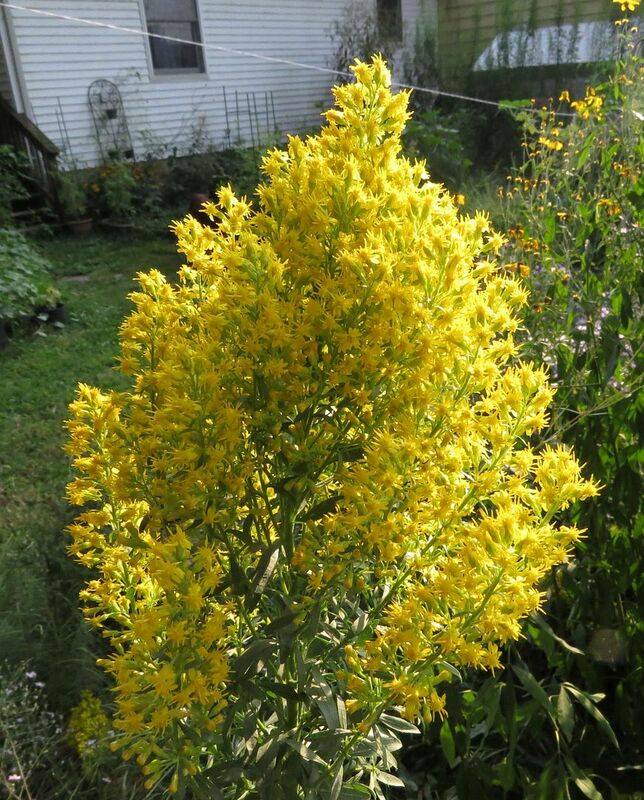 Showy Goldenrod, Solidago speciosa, is worthy of its name but sadly is starting to peter out in my garden a little. So I need to let this reseed a bit, I might even put a few seeds in the green house flats to have in the spring time. 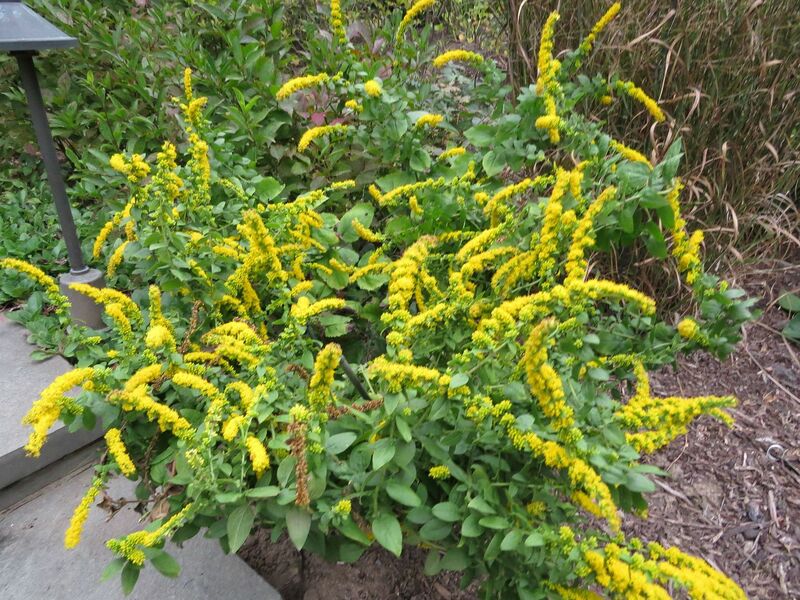 Solidago sphacelata 'Golden Fleece' is an easy going ground cover. 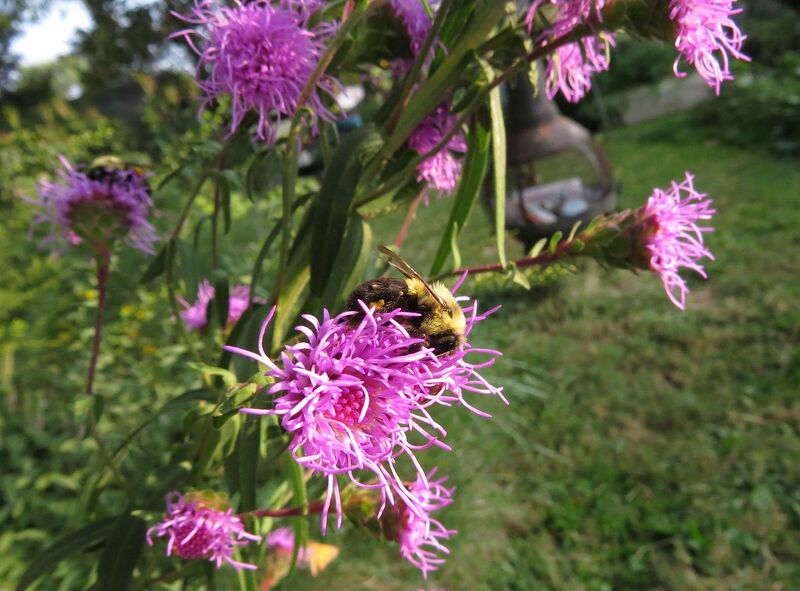 Flowers are smaller than other goldenrods that grow in a similar form, plants are overall shorter too. It's not very aggressive either and forms a nice clump. New England Aster, Symphyotrichum novae-angliae, and Solidago rugosa 'Fireworks' make an excellent combination when mixed together. 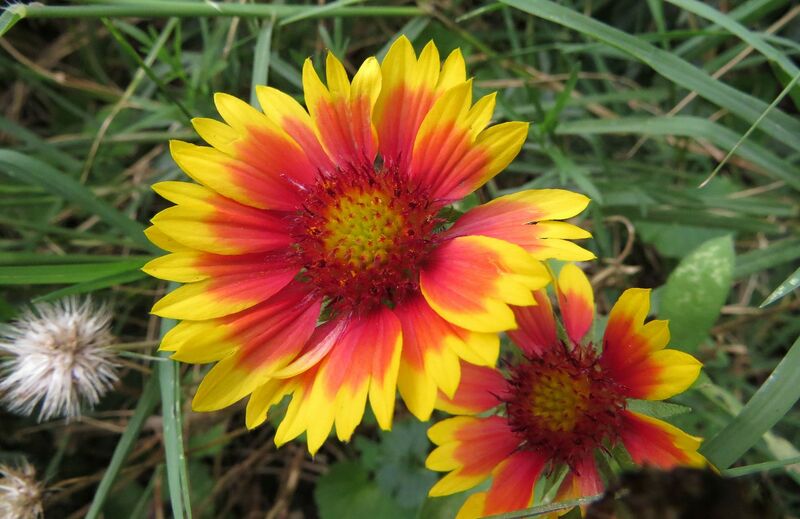 Blanket Flower, Gaillardia species. I normally don't go for red flowers but this one is nice enough that I might put more effort into getting them established in my garden. The flowers are kind of a hot pink though which suggests to me they might be a cultivar. Northern Blazingstar, Liatris scariosa, still flowering. This is the first year I put the bulb in and it pushed out 5' of growth flowering all the way down. It's going to be so sad when this turns out to be a biannual and dies, though it did produce 2 other stems which were smaller but also flowered. Hopefully it clones itself and seeds a bit cause I'm in love with this plant. Sadly this isn't my tree. This was taken at the Mt. 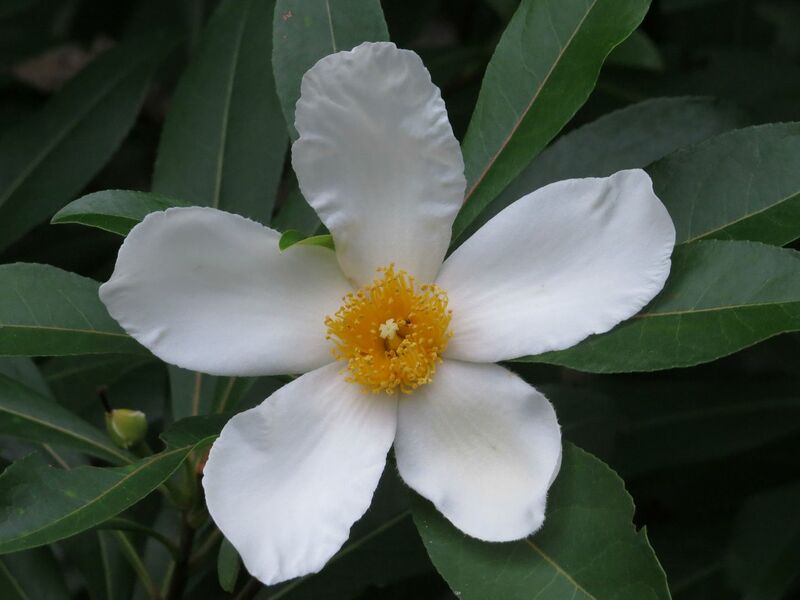 Cuba Center, where they have like two or three of these small trees growing and flowering beautify. My little shrub died last year, but I just bought a new one this year and planted it in a spot that's a little wetter and more noticeable so hopefully I'll remember to water the thing. 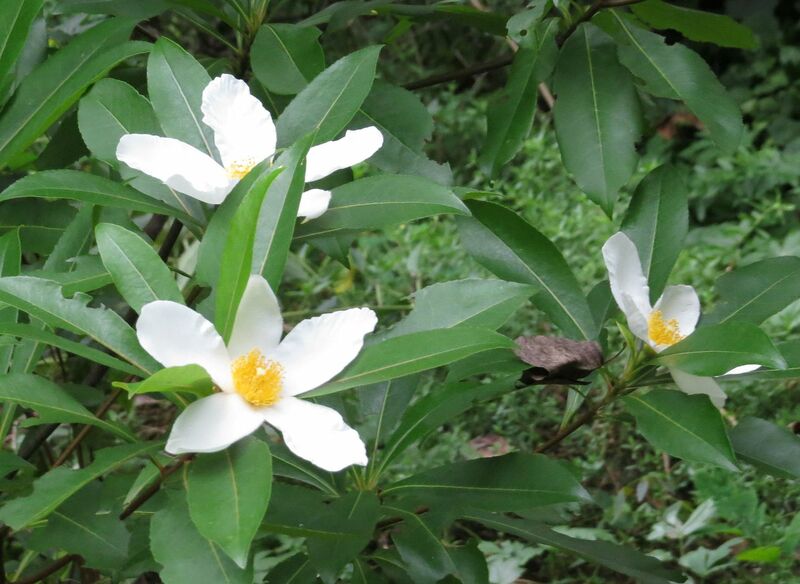 They flower way late in the year, about when things start to dry up so there's that added stress on the tree making them a little hard to grow but not impossible.